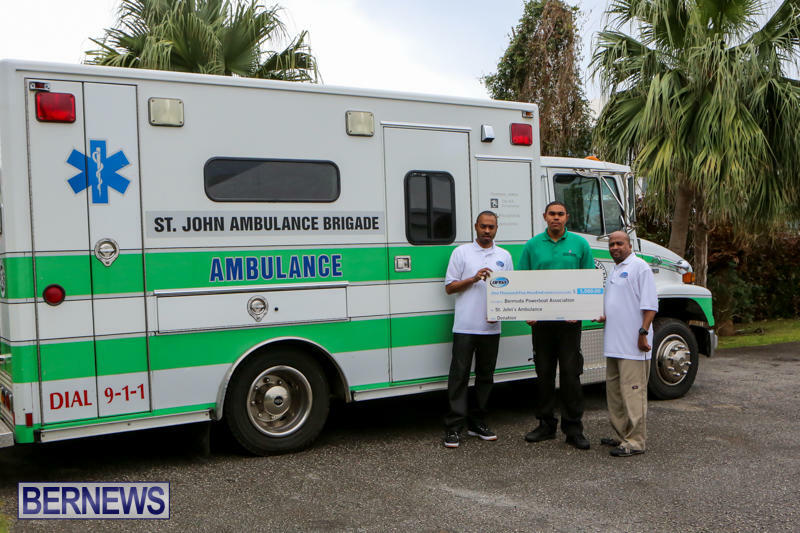 The Bermuda Powerboat Association made a donation in the amount of $1500 today [Feb 18] to St. John Ambulance Bermuda at their Point Finger Road, Paget headquarters. Newly elected commodore of the Powerboat Association Henry Talbot was joined by past commodore Paul Wellman in making the presentation to Jahkhari Woods, St.John Ambulance Bermuda Deputy Quartermaster. The donation is in recognition of the service provided by St. John throughout the 2014 Powerboat Association season. St. John is a non-profit organization that relies on volunteer support and donations from the community to operate. Although St. John is in 40 countries worldwide, each branch is independent and self-supporting. St. John have been attending to the first aid needs of the Bermuda community since 1894. Nice to see the sports groups giving back to SJAB. Without them, many sporting events could not happen. Well done to all the volunteers at St. John Ambulance that make it possible, and thank you Powerboat Association. The Bermuda Power Boat Association can thank the St.Johns Ambulance for many years of assistance. Infact they won’t start a sanctioned race without them.– thats how important they are! Assistance as far back as the 1960′s. — and these fine people are Volunteers. Thank you for saving my Nephew after a 70mph powerboat flip.